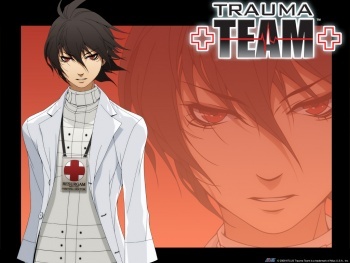 When last we saw Trauma Team at E3, it was a very short trailer that didn't really tell us anything we couldn't already have guessed: the game would include doctors, patients, and of course a healthy (or unhealthy, as the case may be) dose of drama. Having now seen some actual gameplay, I now know that it also has a few new things to offer, including new medical specialties, and a more forgiving bedside manner. Six new doctors will be suiting up to solve medical crises and mysteries in Trauma Team for the Wii. In addition to the traditional surgeon that we're used to, we'll now get the chance to try on the scrubs of an orthopedic surgeon, an EMT, an endoscopist, a diagnostician, and the one I'm most excited about, a forensic examiner. The demo I saw featured Tomoe, the endoscopist, and involved treating an ulcer. Not the sexiest procedure in the game, perhaps, but one that showed off the Wii controls quite well. Though Trauma Team won't make use of the Wii Remote Plus, it does take full advantage of the Wii/Nunchuk combo. Moving the Remote towards or away from the sensor bar while holding down A and B either advances or retracts your scope, giving the procedure a more tactile feel than doing the same thing with the D-pad would. As in previous Trauma titles, the Nunchuk is used to select the appropriate tool for the procedure, while the Remote's pinpoints your target area. Barring the different procedures that the new specialties will allow, I didn't see anything that was too large a departure from previous Trauma titles, though the graphics - in particular the lighting - did look rather nice. Or as nice as someone's insides can, anyway. That said, I'm told that effort is going into making Trauma Team less frustrating for players, by being more generous with prompts and directions. Instructions on procedures will also be much more concise and clear, which hopefully means that you'll never be left flailing around wildly, trying to figure out how to use a particular instrument as your patient bleeds out. I'm also told that the timer will be removed from at least some of the procedures. It's supposed to help make Trauma Team more accessible for casual players, but frankly, I'm thrilled to hear it. I've never been one to think that a time limit increased the fun factor of any particular game, but it really got on my nerves in the Trauma games. The chance to concentrate on the surgery, not the clock, is welcome, indeed. If you're a surgical pro, worry not: Trauma Team has incentives for performing extremely well, though Atlus is keeping hush on what those incentives are just at the moment. I'm hoping to see a demo of the forensic specialty soon. More on that as soon as I have anything. Trauma Team is scheduled for release in Spring of 2010.